I pulled another all nighter last night (well, almost – I slept for 3 hours!) 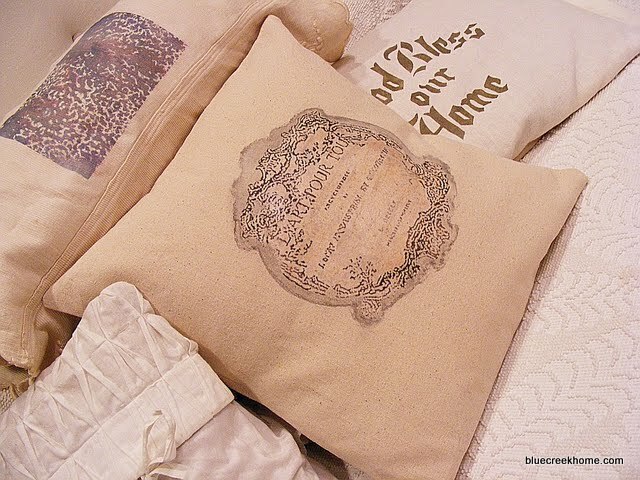 making and listing more pillows and a few vintage finds in “Blue Creek Home – The Shop”. Obviously, a few of these pillows are thrown together props for photography purposes! However, I do like the idea of the smocked one on the left. Maybe it will become a real pillow! 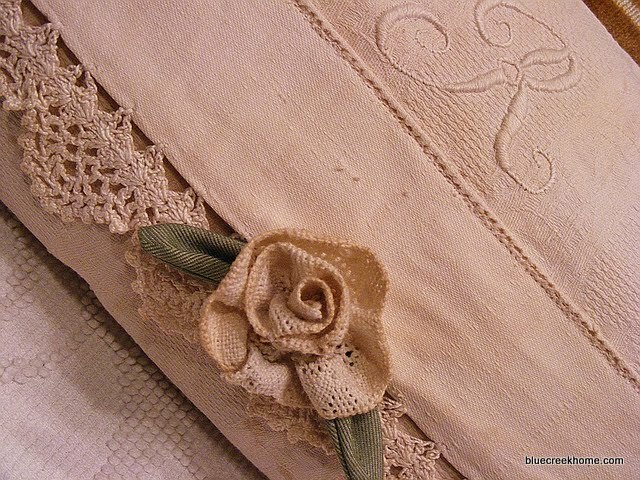 The white pillows on each end do not meet the requirements to be listed on Etsy. 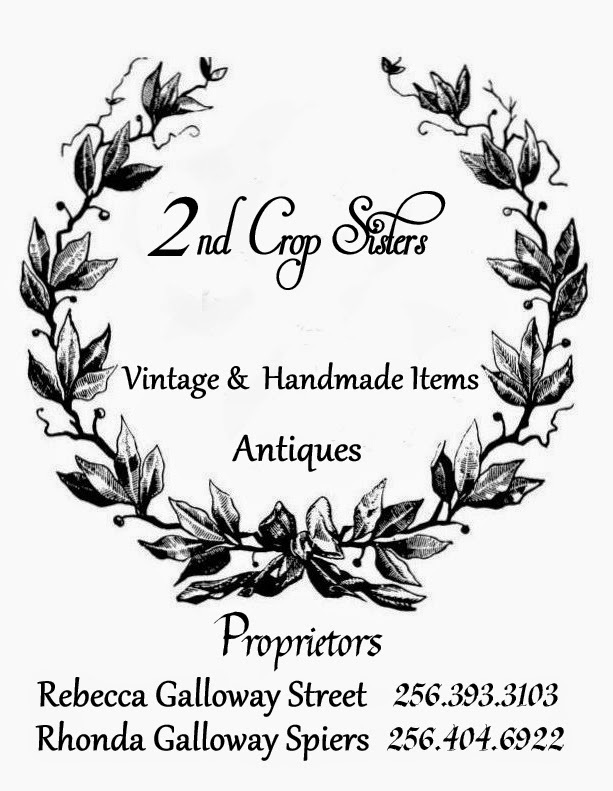 They aren’t vintage, they weren’t made by me, nor are they supplies!! So, they are for sale from here. Do you know an M H G! 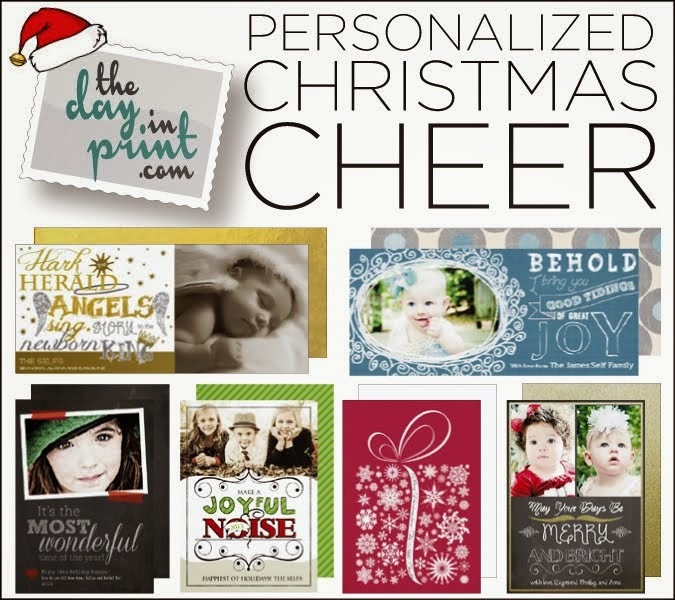 $20.00 + $5.95 shipping or $18.00 + $ 2.95 shipping for cover only. Uses a standard 12” form. 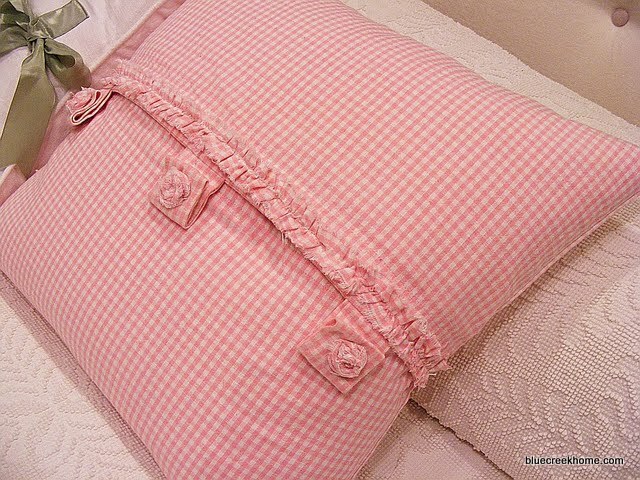 Made by “baby stuff”, these sweet pillows sell for $48.00 in their store!!!! It is in perfect condition. If you know Trina, buy her this pillow!!! $18.00 + $5.95 shipping or $15.00 + $3.95 shipping for the cover only. Uses a 10” x 15” form. It is white linen and in great shape. The back is as pretty as the front. 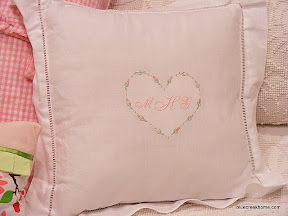 E-mail me if you are interested in either of the monogrammed pillows. These will be going into the shop today. 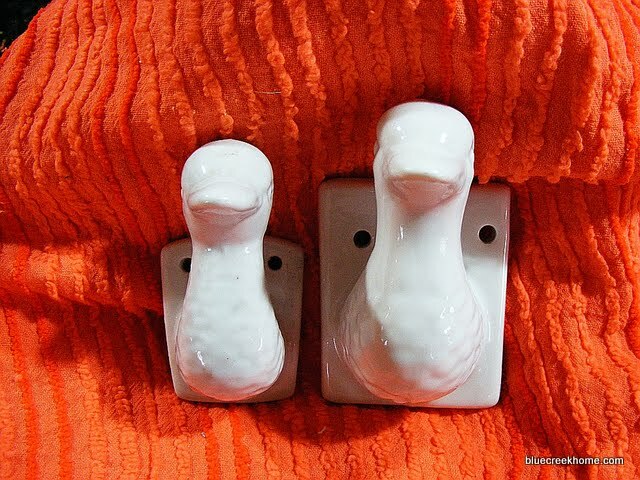 Every time I look at these little porcelain towel hangers, “duck-duck-goose” goes through my head. MAKE IT STOP!!!! I can’ wait to use the fun, orange chenille for something…Hmmm, maybe something Eastery! Vintage goodies waiting to become BCH Originals!! I’m off to the post office to mail some orders and then I am coming home to a much needed nap!! Oh, goodness. You are on a pillow roll. I love it. They really are beautiful. And I really wish that monogram was mine!! lol! Wow girl - they are so pretty. I guess when you get on a roll and making progress it's hard to turn off the lights. I really do like your work. Wow! Look at you go! These fabrics are just gorgeous, too. What a lovely presentation you have given to our day. You do beautiful work! Can you bottle and sell that energy and enthusiasm on etsy?! I LOVE it. 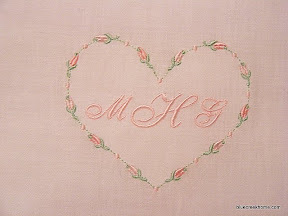 I also love that monogramed burlap pillow you created. Love the pillows!!! They are so pretty! Those DUCK towel hangers bring back sooooo many memories...I was a proud owner of one! 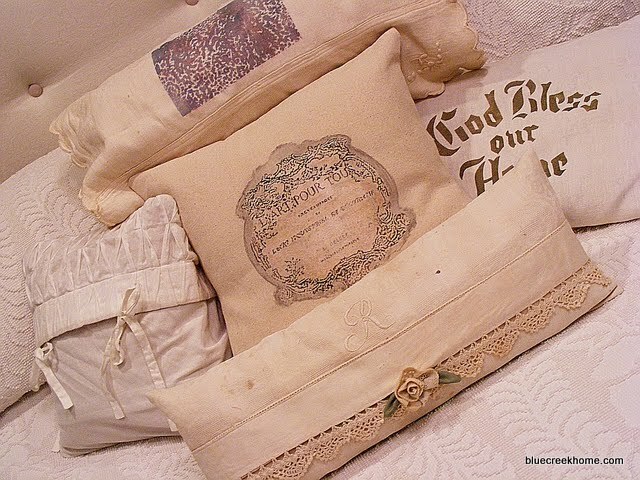 Your pillows are sooooo stunning...I will be sure to pass your ETSY shop on to friends and family. Thanks so much Rhonda for placing the giveaway button!! I just saw this wonderful box filled with shells in the post below -love it! It's in my files now to be included in a future post. Also, I added you to my blogroll too. Thanks!!!! How very pretty those are! I'm going to go check your Etsy. A friend of mine gave me a box with lots of little tid-bits you might be able to use for pillows. I would rather give them to you vs. give them to Goodwill. Would you like me to take some photos and send them to you and see if they interest you? Your pillows are so pretty. I love all the things that you are featuring and I'm sure they won't last long. You are such a busy girl! 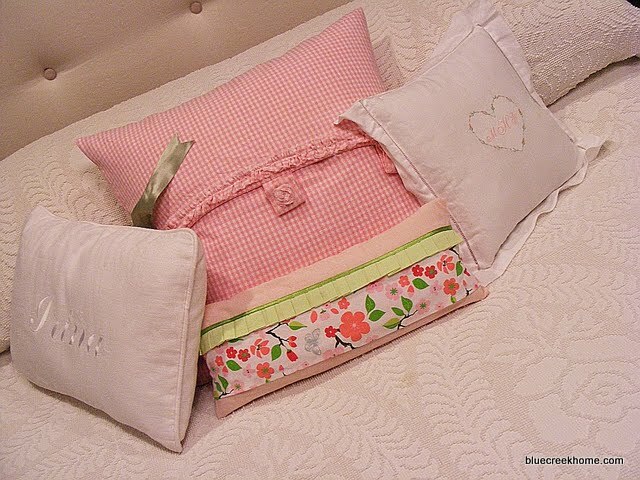 I adore all of your beautiful pillows...where do you gey all of your ideas?! The box is gorgeous filled with all of the beautiful goodies...love it! What beautiful pillows. You are on a pillow roll. Love all of them. Ohhh, I love the flower/rosette. Beautiful pillows. Oh these are gorgeous!!!! Hope you had a good nap! I love the top photo of pillows. So pretty. Good luck with your shop.